October is one of my most favorite months but it’s also one of my busiest. Work is at its peak busy time and we are all running about like crazy getting fundraiser products delivered to the schools. While every weekend is packed with family events, football games, golf tournaments, and fall parties. Needless to say I’m exhausted, but I still love October. I love when the leaves start to change colors, the weather turns cool, and everyone starts getting ready for Halloween. I don’t know about you but I’m excited about Halloween this year. 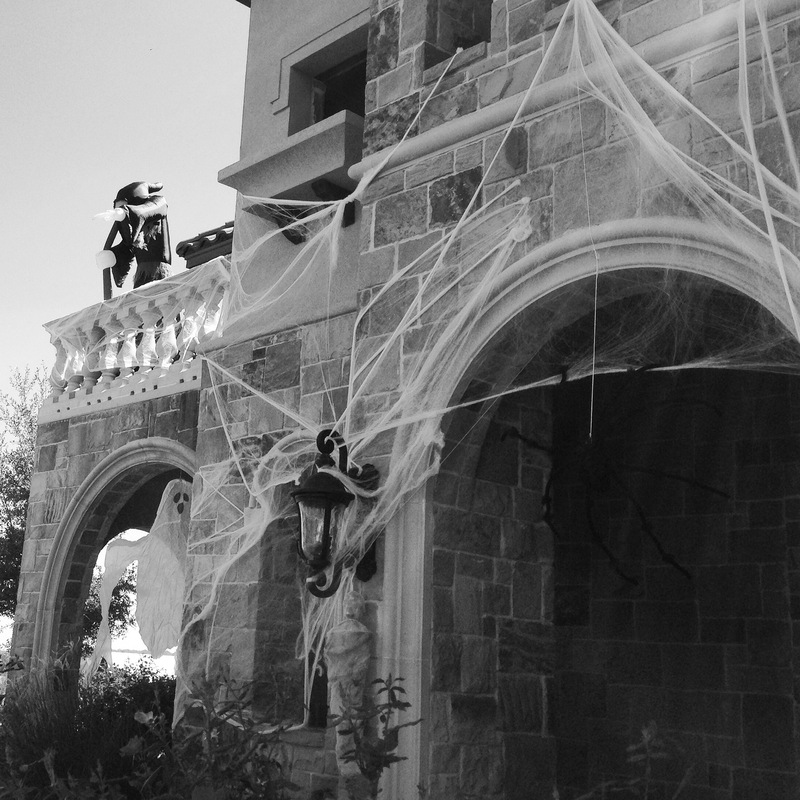 My neighborhood has decided to do a Halloween decorating contest this year and I spent last weekend turning my house into a “Haunted House”. I’ve got ghosts, mummies, spiders, spider web and an inflatable grim reaper. This Halloween is going to be a fun one. Sadly, with everything going on lately there has been little time for cooking, but with the weather turning cool (finally) there is one quick dinner I always turn to my Hearty Italian Soup. I came up with this recipe out of a love for Olive Gardens Pasta Fagioli soup. So over the years I’ve played around with ingredients and this Hearty Italian Soup was my end result. This soup is packed with spicy Italian sausage, veggies, beans, kale and one magical flavor ingredient, the leftover rind from a wedge of Parmigiano Reggiano cheese. I keep a bag of these cheese rinds in my freezer just to add to my Italian soups. The rind infuses the soups with a rich, nutty flavor and adds just a slight velvety texture as the last little bits of cheese melt into the soup. I hope Y’all enjoy and Happy Fall!!! Heat a large soup pot over medium heat with 2 tablespoons of Extra Virgin Olive Oil. Cook the sausage, breaking it into small pieces with a wooden spoon. When the sausage is cooked through, transfer to a plate lined with paper towels and set aside. Drain the excess fat out of the pot, then add 1 tablespoon of Extra Virgin Olive Oil to the pot over medium-low heat. Add the carrots, onion, and celery with a pinch of salt and pepper. Cook until tender, about 8 minutes. Add in the garlic, red pepper flakes, oregano, and tomato paste and cook for one more minute. Add in the white wine and scrap all the brown bits off he bottom of the pan. Add in the canned tomatoes, basil, parsley, kale, Parmigianino Reggiano cheese rind, chicken stock and water. Add the cooked sausage back to the pot and bring up to a boil then reduce heat and simmer for 20 minutes. After the soup has simmered, add in the Cannellini beans, kidney beans and the ½ cup of pasta. Simmer for another 10-12 minutes, until the pasta is done. Remove the Parmigiano Reggiano cheese rind. Serve in big bowls topped with freshly grated Parmigiano Reggiano cheese and a basket of garlic bread. 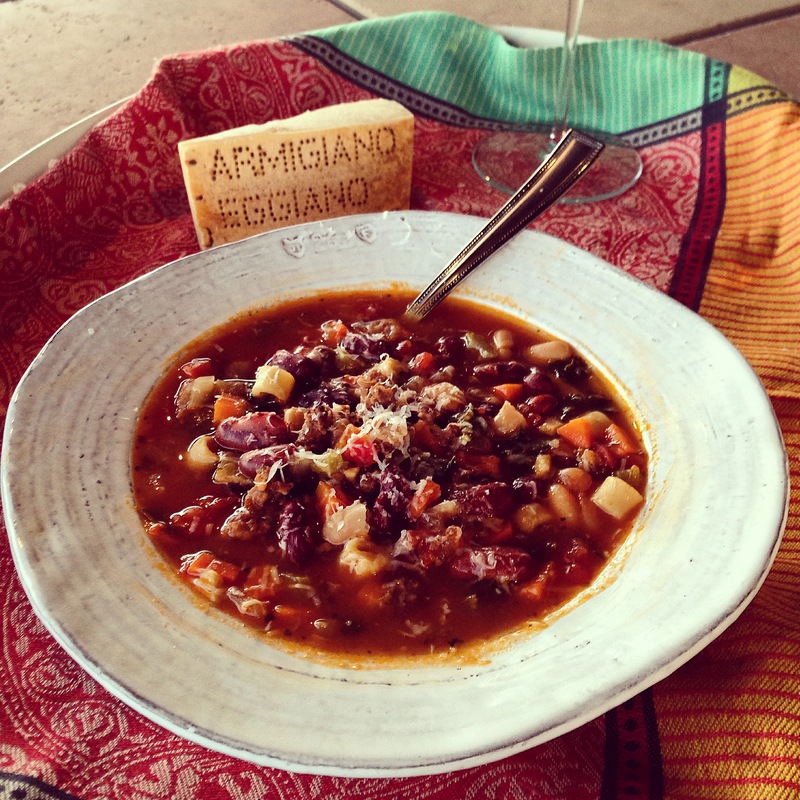 This week for my Friday Fall Favorite Food I wanted to share with you my Hearty Italian Sausage Soup. This soup is easy to make and is packed full of beans, veggies, kale, and hot Italian Sausage. So grab a bowl and cuddle up under a blanket because this Hearty Italian Sausage Soup and is perfect for those cold, rainy October Days. 😀 Thanks!! Nothing like a good bowl of soup on a rainy day!! This looks so hearty and delicious! I’ve been meaning to try making soup with a parmesan rind for a while but have never gotten around to it. One question: the cheese rind in the ingredients list has an asterisk next to it, but I’m not sure what that refers to. Am I looking in the wrong place…? Thanks!! Sorry you’re not missing anything I think I just meant to put that it was optional adding the cheese rind and never did. You really must try it sometime it makes a word of difference in the flavor. I’ve even added a cheese rind to a slow simmering Bolognese I used for a lasagna and it was the best sauce I ever made. This looks awesome Mel!! We are really in the soup mood here too. I finally made a big pot of white chicken chili last week and had leftovers for lunch at school all week! Feels like we are really cooking around here again! Happy Halloween– hope it’s tons of fun! MMmmm White Chicken Chili is one of my favorites!! Got to love soup weather 🙂 Happy Halloween to you too! !